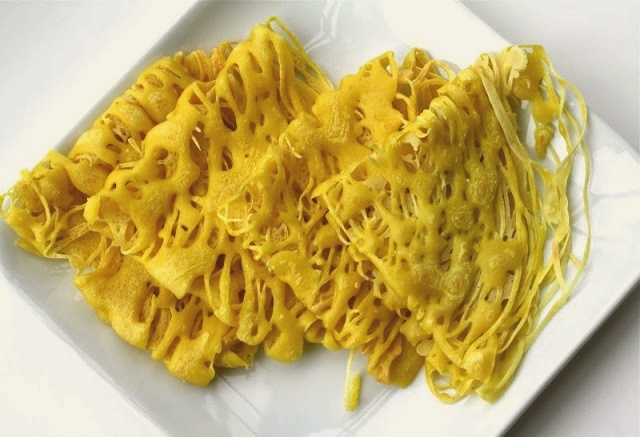 Roti Jala Recipe ("Net Bread"), an alternative to rice, is an excellent accompaniment to rich gravy dishes such as mutton curry or sambal tumis. Roti Jala is a traditional Malay recipe traditionally ladled into a roti jala mold, a contraption that looks very much like a measuring cup with holes poked in the bottom. It is made with flour, milk and an egg that is grilled with a non-stick pan to cook. This recipe is so easy to make which i would you recommend to try this at home! 1. Mix (or using an electric mixer briefly at the end to get rid of lumps) to a consistency batter and put into a cup with few holes at the bottom, or a mustard bottle. If you have the "roti jala" mould, would be great. 2. Set a heavy-based frying pan on low-medium heat and grease with oil. 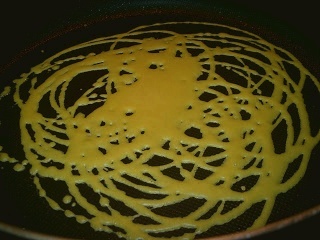 Swirl around on a heated grill or non stick pan like a thin pancake. Wait for the batter to set about 20-30 seconds. 3. Cook only one side. Fold the crepe into quarters or roll and stack up. 4. Repeat all of the above steps, adding oil to the pan each time until the batter is used up. Serve roti jala with hot curry or sambal tumis. Great photo of Roti Jala. Do you mind if I use this picture on mu site? I can mention your site as source. Glad you like it. Sure, anytime. It look really easy to make this recipe. I like Malay food very much and I will try this at home. Thanks. How much is one ‘cup’ in ml? Glad you like the recipe Rai. Tks! Hi what type flour can be used? Can I substitute the coconut milk with evaporated milk? Thank you.